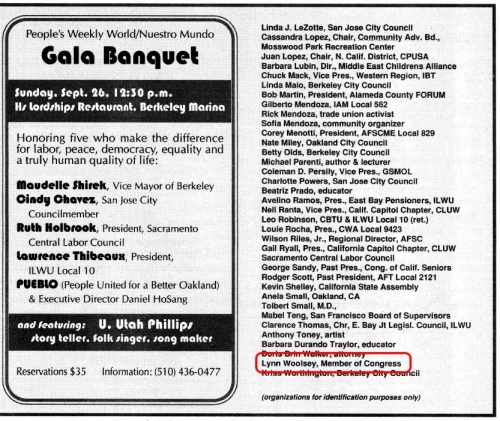 Michael Parenti is listed as a sponsor of the Niebyl-Proctor Marxist Library in Oakland California. He is a leading marxist/progressive political scientist, having received his Ph.D. in political science from Yale University, and the father of Christian Parenti, another prominent progressive activist. "Michael Parenti's latest book, "Make-Believe Media: The Politics of Entertainment", a critical study of Hollywood films and television, will be published in June 1991 by St. Martin's Press." 1. "Subversive Activities Control Board, Docket No. 51-101, Report and Order with respect to the Communist Party of the United States of America, April 20, 1953, p. 6"; and "Modified Report" issued December 18, 1956, p. 116. 2. Committee on Un-American Activities, House Report 1920 on "The Communist Party of the United States as an Advocate of Overthrow of Government by Force and Violence", May 11, 1948, pp. 5 & 36; also cited in the "House Report 209" on the "Communist Party of the United States as an Agent of a Foreign Power", April 1, 1947, p. 25. Other articles by Parenti have appeared in the CPUSA newspaper Peoples Weekly World. The maoist-oriented US weekly the "Guardian" of December 24, 1975, p. 4, featured a large article by the Liberation News Service (LNS) entitled "Cornel Students Oust Gen. Ky". It concerned a speech he was to give to "increase the understanding between Vietnamese and American people." However, the LNS article said that "Fifteen hundred people booed Gen. Nguyen Cao Ky off the state Dec. 9 at Cornell University in upstate New York." Cornell was as hotbed of communists and sympathizers especially in Prof. George McT. Kahin's Southeast Asian studies program, many of them having been leaders of the Hanoi Lobby groups such as the Indochina Resource Center (IRC) and the Center for International Policy (CIP), among others. "The protesters insisted that one of their spokespeople address the crowd for two minutes by Ky and in the face of their growing numbers the fraternity sponors agreed. Prof. Michael Parenti then described to the audience how Ky had commanded bombing missions against the Vietnamese civilian population." (KW: Those raids were often against No. Vietnamese coastal radar installations, anti-aircraft gun positions, and weapons smuggling boats. They had no civilian targets). "Because he 'jailed, tortured and killed tens of thousands of people, he should not be welcomes here,' said Parenti. "We won't be talked to. We demand and open forum." Parenti was practicing a form of "tolerating intolerance", one of the key techniques advocated by Marxist Prof. Herbert Marcuse, a University of California professor and mentor of Angela Davis, a Communist Party USA (CPUSA) member being developed for national leadership roles. In 1992 Michael Parenti, Berkeley endorsed the Committees of Correspondence national conference Conference on Perspectives for Democracy and Socialism in the 90s held at Berkeley California July 17-19. In May 1992 The Communist Party USA newspaper Peoples Weekly World published a May Day supplement. Included was a page of greetings to Sender Garlin, sending greetings for his 90th Birthday. Most of the endorsers listed, were identified members or supporters of the Communist Party USA. The list included Michael Parenti. There is a good amount of information about Parenti's Marxist ideology and activities on behalf of the Institute for Policy Studies (IPS) in the major study of them by S. Steven Powell, "Covert Cadre: Inside the Institute for Policy Studies", Green Hill Publishers, 1987, starting with Part I, "The People, Ideas, and Controversy Behind the Institute for Policy Studies, Chapter One - "East Meets West at IPS", etc. In 1993 Parenti was listed as a among "former Visiting Fellows and Visiting Scholars and current TransNational Institute Fellows" on the Institute for Policy Studies 30th Anniversary brochure. The Progressive Alliance of Alameda County held its founding conference June 1 and 2,1996, Federal Building Auditorium, Oakland California. Individuals came from the New Party, Peace and Freedom Party, Green Party and the left wing of the Democratic Party. On May 20 2000, Michael Parenti lectured at the Sacramento Marxist School on Democracy vs Capitalism. On May 6 2005 Michael Parent lectured at the Sacramento Marxist School on U.S. Empire vs U.S. Democracy. Michael Parenti signed the letter, from the Colombia Support Network . The war in Iraq, like conflicts in which the United States has been engaged for more than a century, is not about spreading democracy but global corporate expansionism, author Michael Parenti told a standing-room-only crowd at a fund-raiser for the Peoples Weekly World/Nuestro Mundo held Oct. 13 here. Despite the recent recall election victory for Republican Arnold Schwarzenegger, the audience showed that the people’s fighting spirit and hunger for progressive views are not curbed. The event raised $4,700 for the PWW. Michael Parenti was one of 100 "prominent Americans" who signed an October 26 2004 statementcirculated by 911Truth.org calling on the U.S. Government to investigate 9/11 as a possible "inside job". In August 2004 Michael Parenti endorsed an anti “Bush Team” Protest at the Republican National Convention in New York, organized by Not In Our Name, an organization closely associated with the Revolutionary Communist Party. Now is the time for all intellectuals, union militants, solidarity activists, political parties and progressive minded individuals who believe in real justice and equality to raise their voices in defense of the Bolivian government and its people. No to US interference in Bolivia! In the late 2000s, Michael Parenti was an assistant editor of University of Minnesota based Marxist journal Nature, Society and Thought;. In 2009 Michael Parenti served on the Advisory Committee of the Independent Progressive Politics Network. More than 100 activists endorsed the call, including Michael Parenti. On July 4 2010, at Berkeley, Calif.: the annual Annual Peoples World / Mundo Popular BBQ was held. Scheduled guest speaker was Michael Parenti. Join us for an afternoon of good people, good food, and good discussion for a good cause! Special guest speaker, Michael Parenti, world-renowned revolutionary scholar. Program at 3 p.m. includes songs to bolster the fighting spirit! ↑ Guide to Subversive Organizations and Publications and Appendixes, HCUA, Dec. 1, 1961, House Document No. 398. This page was last modified on 8 April 2018, at 14:15.